With our custom fabricated “Horizontal Curb Saws,” we have the ability to accommodate your needs with residential and commercial driveway entrances, ADA Ramps, Parking Lot modifications, Access Ramps and any other curb cutting needs. WHAT’S A CURB CUT ? They were originally designed to make public streets accessible to wheelchair users. Eliminates the need for concrete demolition, form setup and removal or pouring and curing new concrete. The curb cutting machine literally cut days of costly, labor-intensive construction out of installing driveway entrances, access ramps, ADA wheelchair ramps, parking lot modifications and more. Who really benefits from them? Today, everyone benefits, whether or not they have a physical disability. If you’ve ever pushed a stroller, carried heavy bags, had joint pain, walked with crutches or a cane, curb cuts have helped you. With our custom fabricated horizontal curb saws, we have the ability to accommodate your needs with residential and commercial driveway entrances, ADA ramps, parking lot modifications, access ramps and any other of your curb cutting needs. Our curb saws are manufactured in-house and showcase our highly skilled team of welders, fabricators, and machinists. Keeping up with the latest innovations and advancements in manufacturing technology allows us to modify these machines for unconventional applications such as concrete bridge parapet sawing and chopping. 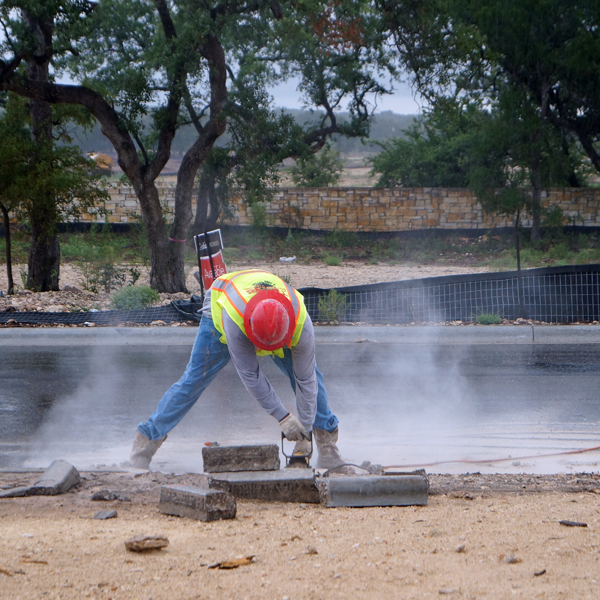 A Texas Curb Cut employee, cutting a curb. 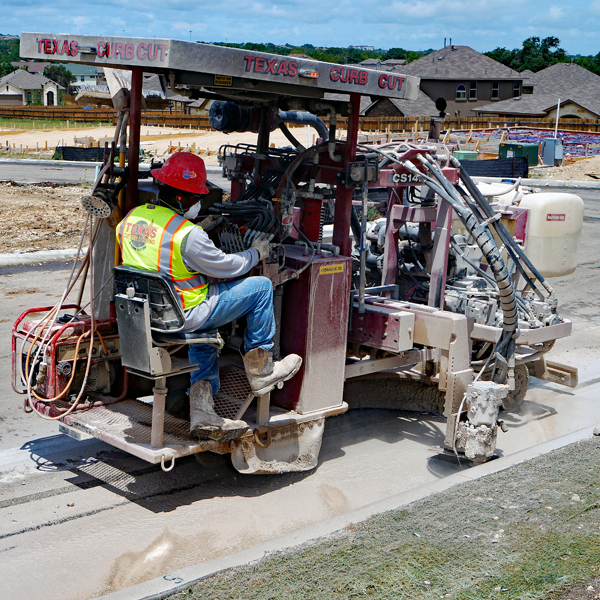 When it comes to curb cutting and innovation of concrete cutting tools and machinery, Texas Cutting and Coring is an industry leader in its field. 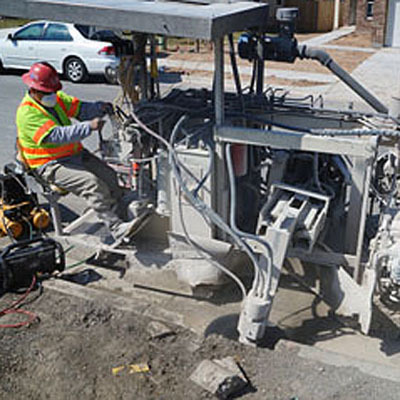 We develop our own horizontal curb cutting machine, designed for quick and efficient concrete cutting for a variety of commercial and residential projects. 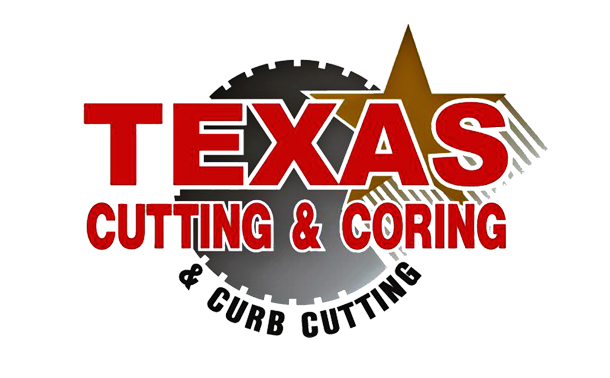 Whether your project requires the services of our horizontal curb cutter, customized wall-sawing machine, wire saws or diesel or electric flat saws, we offer the perfect tools, technical expertise and customization options for any job at Texas Cutting and Coring. Our Texas Cutting and Coring technicians revolutionized the industry in the 1990’s with the creation of our custom fabricated horizontal Barrier Wall saw. With this invention, we made specialized curb cutting services possible for commercial driveway entrances, access ramps, ADA ramps and parking lots requiring wheeled mobility and handicapped access. We have since developed modifications to our curb saw that allow for more precise concrete bridge parapet sawing and wall sawing, as needed for special projects. Today, curb ramps are a necessity for all compliant public facilities nationwide. Our exclusive curb cutting machinery has allowed our valued clients to perform necessary curb-cutting projects in a more timely, affordable and efficient fashion. 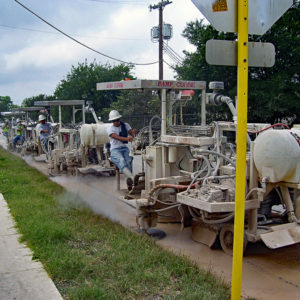 Curb Cutting in San Antonio with 4 Curb Machines. Why are curb ramps so important? A curb ramp is a short ramp cutting through a curb or built up to it, and is designed to create safe access for those who use wheeled forms of mobility. Without them, individuals who use wheelchairs would not be able to independently transition from a curbed sidewalk to a roadway and vice versa. In the city of Austin alone, around 15% of the population is made up of people with disabilities, making curb ramps an essential necessity for the community. Where else do we need curb cutting services? While curb cutting is essential in providing greater access to those with limited mobility, curb cutting is also needed for a variety of residential and commercial projects. Sites including highway-adjacent roadways, access roads, and even simple residential lawn renovations often require the use of our innovative curb cutting tools. 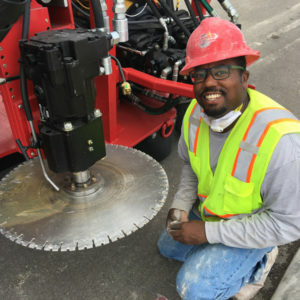 Whatever the task, our custom curb cutting machine can help to make cuts quicker, less labor intensive and more efficient for the operating technician. Blade replacement on one of the new Concrete Curb machines. How does curb cutting machinery work? Our specialized curb cutting machine is capable of horizontal and vertical cuts of up to 14 feet. Our exclusive machinery is capable not only of larger cuts than the average cutting saws but also allows for cuts to be made from virtually any angle, which means we can cut any curb into smaller manageable pieces for removal or reshaping, versus having to excavate the entire curb. 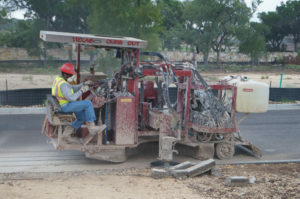 The invention of this specialized machinery at Texas Cutting and Coring has opened the door to a broader range of options for our curb cutting clients. 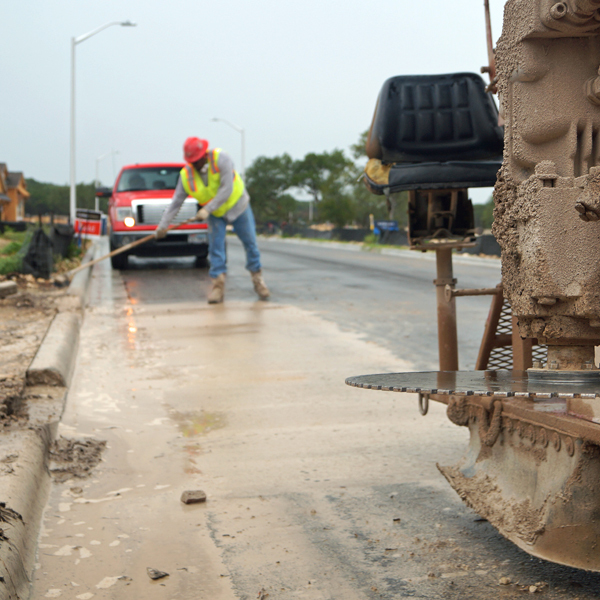 Why choose Texas Cutting and Coring for curb cutting? 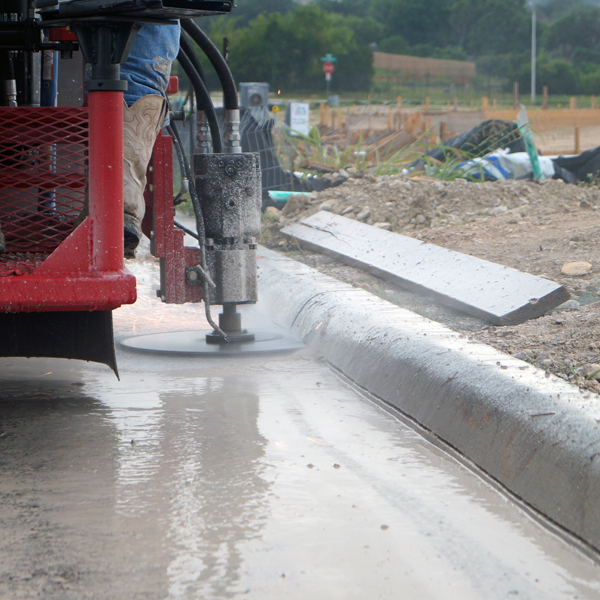 The horizontal curb cutting machine aids in the construction of a variety of large-scale national projects. 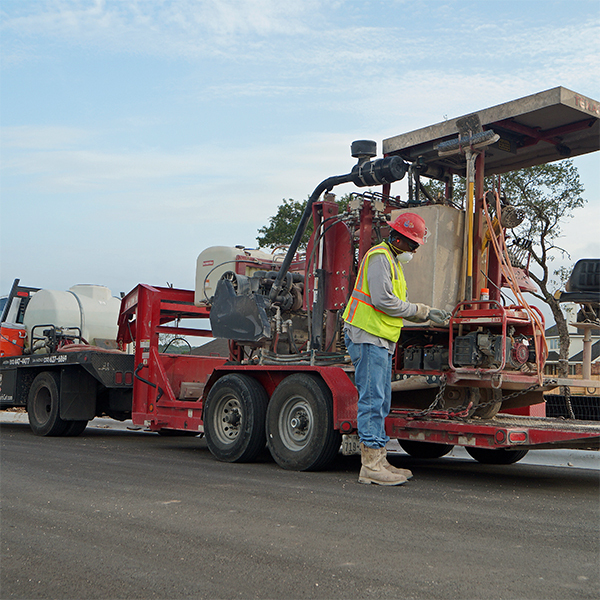 Texas Cutting and Coring is the premier consulting and construction agency for all of your concrete needs. With more than two decades of experience in residential and commercial renovations, as well as serving high-profile corporate, municipal and transportation clients, you can be sure our expert technicians will support your project’s needs and provide unsurpassed results—on time and on budget—every time. 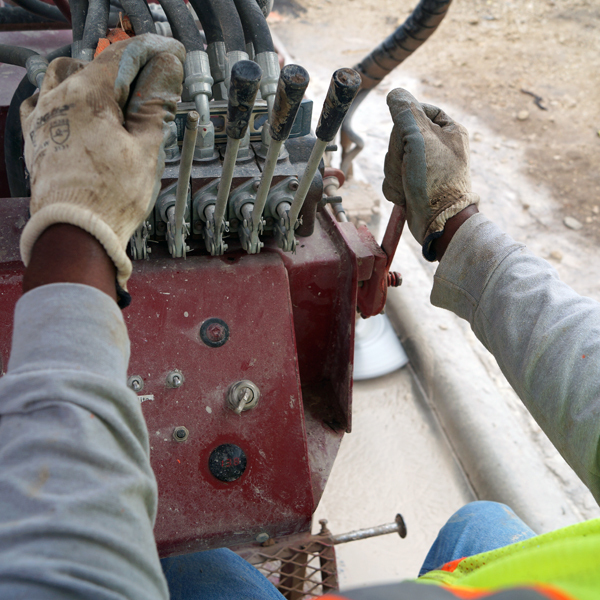 Our commitment to customer service is just one of the things that make Texas Cutting and Coring unique. As design guidelines, standards and regulatory processes for ADA compliance continue to evolve, the need for a curb cutting contractor that is thoroughly trained on ADA requirements becomes more and more imperative. Our team is well versed in the codes set forth by the ADA and has extensive field experience designing ADA compliant curb ramps. In the 90’s, Texas Curb Cut pioneered the development of the horizontal curb saw, which completely transformed the way curb ramps are created. Before, installing wheelchair ramps, driveway approaches and access ways was an extremely labor-intensive and time-consuming process that could take days to complete. The horizontal curb saw eliminates the need to remove and replace the curb by making longitudinal cuts through the concrete at variable angles. The savings in time, labor, and materials by using the horizontal concrete saw over traditional methods are quite substantial. Our curb cutting machines are manufactured in-house and can be modified for other uses. 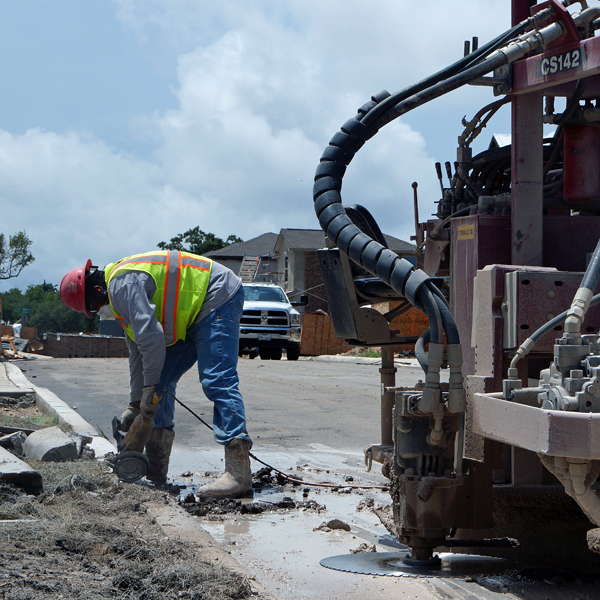 Throughout the years, Texas Curb Cut has performed numerous curb cutting jobs in Texas and across the nation. Whether you need concrete cut for driveways, handicap ramps or parking lot modifications, Texas Curb Cut has you covered!